Given the legendary status of the Walt Disney brand in popular culture worldwide, you will be intrigued to learn the true story of the man behind this brand. Born into a family with a very strict and domineering father, and growing up on a farm, Walt Disney and his brothers had it rough and eventually, they all ran away from home quite early in their lives. The older brothers Herb and Ray Disney were the first to run away and went to work in the city. Roy, with whom Walt co-founded The Walt Disney Company, also ran away at age 19. At 16, Walt dropped out of high school to join the army during the first world war, but he was rejected for being under-age, so with help from a friend of his, he lied about his age to the Red-Cross and was then employed as an ambulance driver. An interesting fact from this period of his life is that he got some serious troubles for painting cartoons in his ambulance. This vehicle, if existed today, probably would be valued at millions of dollars. After the armistice of November 1918, he was shipped off to France where he would work for about a year. Walt Disney presenting ‘Snow white’. In 1919 after the war, Walt returned to Kansas City, but nobody would hire him neither as a cartoonist nor as an ambulance driver. After struggling for a while, Walt was delighted when his brother Roy finally helped him to get a temporary job at an art studio that created advertisements for magazines, movie-theaters, and newspapers. It was here that Walt met Ubbe Iwerks, who would later become a long-term partner and also Walt’s oldest friend. When their temporary contracts ended, the two started the Iwerks-Disney Commercial Artists company. The company did not last long because of financial problems, so Walt went to work for the Kansas City Ad Company to earn some money and Iwerks also joined him there later. Walt’s boss at the ad company allowed him to borrow a camera to use in animation experiments at home, and after reading a book on the development of animated cartoons, Walt plunged fully into the world of animation. His first animations were quite successful around the Kansas City area theaters and with the proceeds from these animations, he started his first animation studio called Laugh-O-Gram. He then hired additional animators including his old friend Ubbe Iwerks, but again financial problems plagued the company too. He couldn’t manage money well and many local theaters were refusing to show his animations. He even moved out of his apartment and lived in the Laugh-O-Gram for a while, feeding on canned food. Soon after, the company went bankrupt and Walt decided that he was probably not a good enough animator, he would try his luck at acting. In the summer of 1923, at the age of 22, and after two failed business attempts, Walt Disney headed off to Los Angeles, California armed with $40 in cash and a cheap suitcase containing one shirt, two undershorts, two pairs of stockings and drawing materials. After a while, he and his brother Roy discovered that there was no animation studio headquartered there in Los Angeles, so after two months in California, they started their own animation company. This was the third company Walt had started, but unlike the other two, this one became truly successful, most probably because this time around, Walt focused completely on the animations while Roy who had worked in a bank and was much more business savvy focused on the business part of things. The two brothers worked first on the “Alice Comedies”, for which they received their first payment of $1,500. Walt did the animations while Roy worked as the Cameraman. Their teamwork started to pay off, even more, when Universal Studios ordered a production from them, it was called Oswald the lucky rabbit and it became an instant success. Walt decided that they needed more compensation given the high level of success of the Oswald project, so in February 1928 he went to New York to negotiate better terms. On arrival in New York, Walt discovered that the Universal Studio’s producer had teamed up with his wife, who was also Disney’s distributor for the Alice Comedies, to steal the Copyright of Oswald the rabbit, and not only that, all of his animators except Ubbe Iwerks now worked for Universal Studios as well. Walt was offered a 20% cut in pay but he refused it. On the train ride back to California, he devised a new character to replace Oswald the rabbit, inspired by one of the mice that ran around his office back in Kansas City. He originally called it Mortimer Mouse, but his wife would later convince him to change its name to Mickey Mouse. Ubbe Iwerks, Disney’s only remaining animator at the time who refused to betray his good friend and jump ship to Universal Studios was the one who took over the animation of Mickey Mouse but Walt gave it his voice. In 1927, MGM Studios refused to distribute the Mickey Mouse project stating that a large mouse on the screen would frighten women away, but Disney continued to search for a distributor. The first two Mickey Mouse animations had no sound and no distributor agreed to carry it but a year later in 1928, Disney released another Mickey Mouse animation which became an instant hit. It was called “Steamboat Willie” and was the first animated film to have a soundtrack. From that year onward, Walt Disney became a rich man. Walt Disney now had no more money problems but he was stilled obsessed with the idea of making an animated feature film. People laughed at this ridiculous idea of his and the project was even dubbed Disney’s Folly. 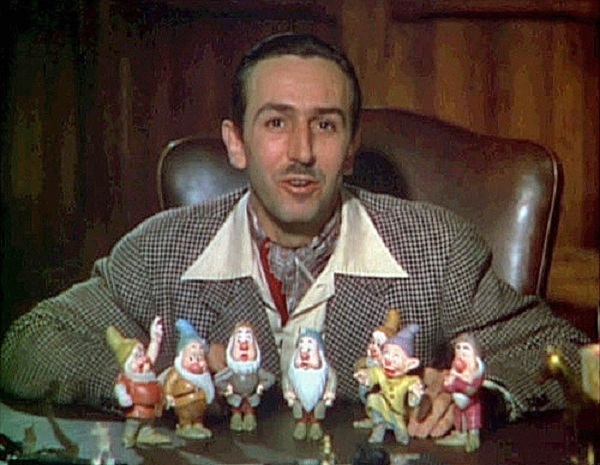 His wife, brother Roy and friends begged him to abandon this idea of an animated full-length movie, but Walt was adamant and moved forward with his plans. It took three years to complete it and the company ran out of money even before its completion so that Walt had to borrow money in order to complete the project. But, in February of 1938, the film was released and Walt Disney set another record with “Snow White and the Seven Dwarfs”. It was the first American feature Film in Technicolor and made over $8 million in earnings on its initial release, which would be equivalent to about $130 million today. With that, Disney had arrived, and the rest, like they say, is history. Liked the story? Share it with friends and support our site.